As I have been strangely absent quite a bit the past few months, you may have been asking, “What the heck is up?” Well, this is it! I’m so excited to bring you the first episode of my new podcast, CraftLife. The topics covered in this podcast will hopefully be as varied as my creative interests can take me. I would love to hear what you think about the show! Leave me a comment at the bottom of the page. Check out Amy Finlay’s awesome knitting techniques videos. …while Catti-brie would prefer you to read about her fiery warrior-maiden namesake in any of The Legend of Drizzt books, by R.A. Salvatore. *A note about grits as whole grains. Not all grits are whole grain, in particular instant/quick grits. Most grits that are “stone-ground” are whole grain, but as always, check the label. Looking for a knitting project? Try Amy King’s Boogie Vest, or, if you’re a Dr. Who fan, the knitted Tardis Stuffed Plush by Penwiper. Magda Sayeg, yarn-bomber extraordinaire, was interviewed on “The Story”, March 17th episode. Curious about hand spinning? Marti at La Tea Da Designs can set you up with an awesome drop spindle starter kit! 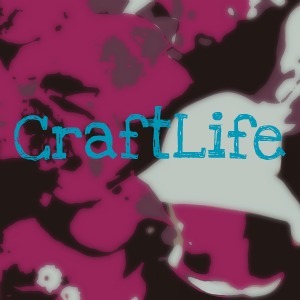 CraftLife is now on iTunes! 25 Responses to "CraftLife Episode One – And So It Begins"
Thanks! So glad you like it. Great Podcast, Amanda. I am enjoying checking it all out! Thank you, Marti! I really did have such a good time with your drop spindle kit. Many thanks, Martine! That means a lot coming from you. I’m so glad you’re enjoying it, JJ! Yes, I actually had grits for supper last night. We like to do a little “breakfast for supper” about once a week. If you block acrylic quite aggressively it’s blocked and stays that way. Sometimes blocking ruins acrylic knits. Wool and other natural fibers can be reblocked and you can’t really ruin them by blocking like acrylic. Maybe you should try undoing the crochet and try again and make it tighter this time. Regarding your TARDIS: Did you attach the floats to the back of the fabric all at the same place? That would definately create unplesant folds. In case of long floats change the place you tie them in the back on every row. But in this case there are long vertical color changes and I’m afraid there’s no way to avoid folds beside the windows and doors and stuff. I think it’s better to frog the standed knit and do it in intarsia like it was meant to be. Stranded knitting doesn’t work well with this type od colorwork. But don’t worry. Make a lot of mistake, becaus That’s how we learn. I proudly knit in public. I used to do it more often. I knitting during lectures and breaks at my University, but I no longer have lectures. duplicate stitches. It easy and you learn to darn at the same time! PS: I’ll listen your second episode later today ad I heard about you on iMake podcast. Hello Satu! Thank you so much for your direction regarding the Tardis – you are the first person to address it. Yes, the floats were all tacked at the same point in the pattern, and I think you have advised me well to frog it. I will definitely do that when I eventually resurrect it from the UFO pile. The pink ribbons that I’m currently working into the fingerless mitts are cabled, but I do think that a nice duplicate stitch would be great for some of the other pink-ribboned ideas I have in my que. Duplicate stitch is a technique I have not yet had the opportunity to try, but it is right at the top of my list of new techniques to learn. Why wouldn’t I knit in public? I really don’t care what strangers think about my knitting, in fact most of the reactions have been positive. I am NOT of the age where people think I’m too young but I really don’t care and have never cared if others don’t like it. I do not knit in church but that is personal preference not because of others. Get over caring and you will enjoy knitting even more. Happy knitting! Amen, Susan! Yes, I do sometimes wonder at people’s reluctance to knit in front of others. But I have to say that church is also one place that I have chosen not to knit, at least not during the service. Now, when my knitting group gets together at church, that’s a whole different story. WONDERFUL!!! What a joy to listen to you. Knitting in public- most definitely! Not shy about it at all. Who knows, it might spark an interest for someone and then we will have another knitter in the ranks. Blocking – acrylic is just not made to block. It is hard to work with and the life is sucked out of the fiber when you try. Check in with the Woolie Ewe fold about your project questions, they are so helpful. Spinning – You might want to talk to Kim about spinning at our next ministry meeting. She gave me a spinning lesson and will even let you try her spinning wheel! Grits – I’m from Wisconsin…nuf said. Tried them once and am not a fan. I guess it helps to be from the south. Can’t wait to hear more! Thank you, Kay! I’m having a ball. I will definitely have to talk with Kim. I admired the spinning wheels from afar at the Fiber Fest, but I have a feeling that, eventually, I will no longer be able to stay away. And thank you for the Woolie Ewe tip – I will have to check them out. What is the rss feed? Hi Charles! The rss feed is: feed://treacleandinketsy.wordpress.com/feed/. It picks up each new blog post, including new podcast episodes. Just starting to listen to podcast #1 (I’m late to the party), Clothed in the Lamb mentioned it in her latest podcast. I think I’ll be hooked from what I’ve heard so far. I see you mention something about Dr. Who – if you are a fan, check out Knit, Knit Cafe. Abby and her son are both fans. KIP – You bet. Without issue. Sometimes I hide behind it (please don’t talk to me) and other times, I use it as a conversation starter. Thank you for taking time to talk to us. I’m so glad you’ve discovered the podcast, Michele, and I hope you enjoy the rest of the episodes! Thanks for the tip about Knit, Knit Cafe. I haven’t checked them out yet, but I will have to go do that. How in the heck do you know so much about yarn and knitting when you’ve only been knitting for 6 months?! I’ve been crocheting for about 8 years and still haven’t gotten so into it as you are! Great first podcast! Enjoyable to listen to. Thanks, MJ! I’m glad you are enjoying the podcast. That’s 2 clever by half and 2×2 clever 4 me. Thaskn! I can help you spend that remaining $300. Haha just kidding. But seriously, I feel like when I’m in a position to spend money, I’m frugal – when I don’t have money, I want to buy everything in sight. Congrats on the new clothes! Why do you suppose the Talmud has any historical reliability for the veracity of the LXX?This is the same Talmud in which study of the Tanakh itself is denigrated as having no merit. And, there is virtually no scholarly support for Jamnia being the event that finalized the Tanakh.